Welcome to Tonight’s Dinner. 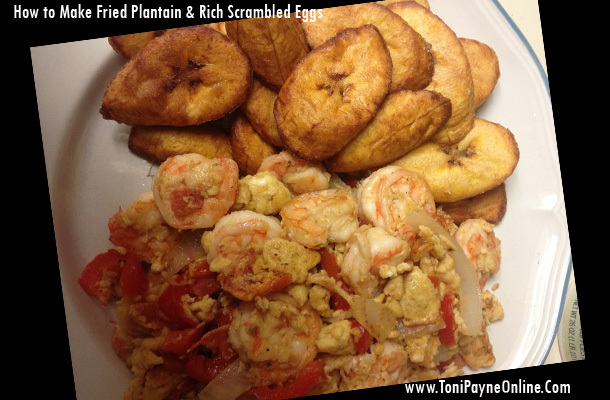 On the menu we have Fried Plantain and Rich Scrambled Eggs. I am not a big fan of plain eggs so I added a bit of vavavoom to my eggs using Shrimp, Bell Peppers, Tomatoes and Onions. I am not awesome on traditional recipe writing so I will just give simple instructions on how I made tonight’s dinner so feel free to improvise. Let us start with things you will need. This should serve 1-2 people. 3. Heat Vegetable Oil in Large Frying Pan. 5. Allow it fry till it is light brown on one side, then carefully flip each one over and allow fry till both sides are a light to medium brown. (If you are not sure how brown, see picture above. Your Plantain is ready to eat. Simply serve on your plate along with your side(eggs in this case) and you are good to go. 1. Remove Shrimp from Shell carefully. 2. Using a small kitchen knife, cut down the back of the shrimp to Devein it. (this is the part I spend a lot of time one because I absolutely dislike the look of shrimp veins so I make sure I get it all out. 4. Cut other ingredients (onions, pepper, tomatoes) into small pieces and place into a separate bowl. 8. Pour in eggs and stir till scrambled. 10. Using the frying spoon, take out the eggs and serve. (Note: we did not use a lot of oil for the eggs, just enough to fry the eggs so there will be no need for the oil sifter bowl. Note: I did not use Salt in my eggs. This is because I prefer the taste of seasoning vs salt in eggs. Have you successfully made this meal? Feel free to share you experience below. If you have any questions feel free to ask below too. Love to cook? You can also read my review on the Aroma Rice Cooker here. If you like what you see, do feel free to click on the share buttons. I love plantain. Those eggs look yummy. Looks delicious, I would love to try out this recipe on the weekend! haven’t eaten plaintain in a LOOOOONG time. damn.